Did you ever have the dream that you are giving a speech, naked? Have that anxiety before the first day of school? Have you put yourself "out there" only to worry about the consequences? This seems to be the current theme of my life. Last week was the first week of school for my 1st and 3rd graders. Molly, my first grader, was (and still is) worried about making friends on the playground. "What if they run away when I ask them to play?" And sadly, that is what first graders do, when they don't know what to say. Mary, 3rd, was worried about getting the new teacher. I am sure the new teacher was just as worried about her class full of young eager faces. My out on a limb experience came in the form of an art project. As you may have read in our springtime blogs, Kerry and I occasionally give each other assignments. It was my turn, and I chose wooden boxes as the controlling form. We decided to make it a multipurpose project and choose one of the the listed themes from Stampington, so that if we liked our project we could submit them for their Somerset Studio publication. The theme we choose was GREEN. 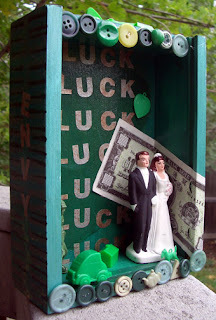 My box was a study of Luck and Envy. Envy on the outside, luck on the inside, with depictions of what others may be envious of and what some may find with simple luck. When it came time to send in our projects for the publication, we reached a block. First, we couldn't find the address. The next time we tried to ship, we didn't have the right boxes and packing material. Finally, we got it together and packed and shipped the projects. We have no idea if they will ever be used. But putting it out there to be judged was a bit scary. I guess that's how it is with life. If you put yourself in a position to be judged and assessed, that can be a bit frightening. It might be as simple as cooking a meal for a new friend, reconnecting with an old friend, or throwing a party. There are always the lingering questions, have I done it right? It could be as life changing as applying for a new job or quitting an old one and the question is have I made the right decision? In the end, I hope that I have done the best I could with what I have. And, I hope that others have done the same. Our studio is currently under construction.... nothing too major. Kerry and I wanted to get organized. We also needed to clean! For the most part, we close the studio during the summer to be with the kids while they are out of school. While the studio is closed, it is hot. 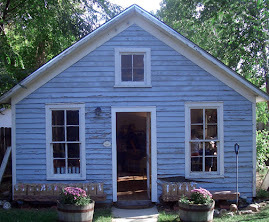 There is no air conditioning in the tiny building that was once used as a school for coal miners children. Imagine that... the little room filled with hot, sweaty, rambunctious children. Instead, we had creepy, crawly bugs move in during our absence. Mostly harmless spiders and a few box elder bugs (which our children affectionately call Love Bugs). After lots of sweeping, vacuuming, and mopping, we feel much better. Our space is, once again, ship-shape! 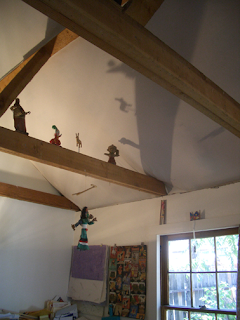 As an added project we decided to install a new ceiling. And by "we" I mean that "we" asked my husband, Jeremy, to do it. 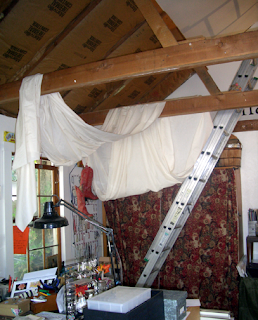 The first photo shows the installation process. Jeremy said it looks a little like Denver International Airport. But the finished result is beautiful! Now that school has started and fall is fast approaching we are back to work. We have been working hard to rev up for the Fall Launch Party in September, and our Fall Art Sale on October 19 and 20. The first peek for the "public" will be this Friday at our Coffee Hour from 9 - 11. Stop by for a cup of Joe! 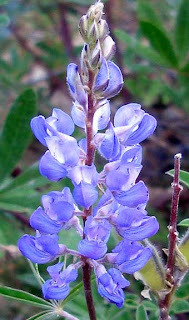 Another Rocky Mountain Wildflower, Blue Lupine. This one is related to the Texas Bluebonnet, I believe. Meanwhile, school starts for the kids in a little over a week. Next week are "Meet the Teacher" Night and Early Assessment Days. This weekend is our last real weekend of the summer. When we're they're all back in school, Kerry and I will be going full blast to get our Fall jewelry and events ready for you. We are excited for what we have planned! Today we were looking for something interesting to occupy our Sunday afternoon. We decided to check out the paddle boats at Waneka Lake (in Lafayette, Colorado). 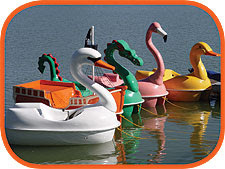 They have a beautiful fleet of brightly colored animal paddle boats. For $6-8 per boat, depending on the size, you can spend 30 minutes tooling around the lake. Believe me, 30 minutes is plenty of time peddling for a 5 and 8 year old. We chose the 4-person, white pelican boat (not pictured). All four of us had a great time peddling around the lake, and watching the fish jump. It was a nice Sunday afternoon. You can find more information on the City of Lafayette website. The girls and I recently picked cherries at my in-law's house. It was a comical experience to pick fruit from a tree with my two girls, aged 8 and 5 1/2. Mary, my oldest, could reach higher than her little sister, and was able to reap a bigger bounty. But she would scrutinize each cherry for worm holes and scars from the bird's pecking. She tired of the job after 15 - 20 minutes. Molly, my youngest, seemed busy as could be. Although she couldn't reach as many, she climbed the step ladder and I thought she was picking away. 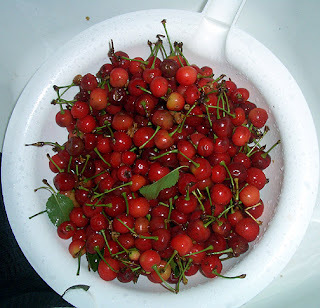 After 15 minutes, I had several cups of cherries in my bag. Mary had some cherries, but her perfectionist methods limited her quantity. I asked Molly how many she had, her answer, "three." All she had was three. Amazing. It reminded me of my favorite childhood book, Blueberries for Sal, by Robert McCloskey. Such is the life of a five year old. On a recent trip to the mountains, I snapped a few shots of flowers. I was amazed at all the wild flowers in bloom. We saw white and pink yarrow, wild daises, lupine, Indian Paintbrush, Galardia (blanket flower), goldenrod, wild roses, and many others. 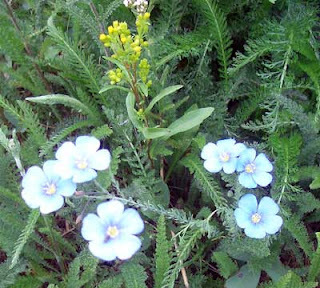 This one is blue flax. I am not sure what the yellow one is, maybe goldenrod.